Light: Exercising tact or using diplomacy. Defusing a tense situation. Knowing what to say and how to say it. Making others feel comfortable and confident. Bringing out the best in everyone. Having a way with words. Telling jokes. Possessing a knack for music, math, art, or science. Shadow: Knowing exactly what to say to destroy another person. Withholding critical information. Using a barbed tongue to upset others. Employing sarcasm. Mimicking others unkindly. Making light of the less fortunate. Being disrespectful. Failing to use the talent you’ve been given. Personality: The Queen of Swords can represent anyone who wants to encourage others (Queen) to be brighter and more communicative (Swords). The Queen may also represent the tendency to be more tactful than objective, or the need to express information more politely than precisely. Story: The Main Character must deliver news that is difficult for others to receive with grace. Alternatively, the Main Character must confront the less desirable aspects of his or her personality. Relationships. You can’t change other people, but you can provide gentle prompts designed to help them be the best they can be. Know the difference in supporting and nagging. Know, too, that requested advice is always prized more highly than unsolicited observations. Until you’re invited to speak, hold your tongue. Work. Harsh criticism crushes morale, but finely-tuned words of praise can enhance performance and elicit remarkable productivity. Identify what must be changed, but express that change in terms of growth and benefit. Instead of problems, see challenges. Instead of deficits, see opportunities. Spirituality. Practice the delivery of praise. When you receive blessings, voice your thanks. When others work for you, show your bright spirit by acknowledging their contributions. Whatever the situation, strive to be the soul of encouragement. Personal Growth. Your insights, opinions, and attitudes influence others more than you know. Express your thoughts with care, making sure you phrase your observations in ways that encourage growth. If you need encouragement, encourage others to give it. Fortune Telling. This card represents a woman with an artistic, intellectual nature, likely born between September 12th and October 12th, who uses clever, positive communication to sway others to her point of view. When? Between September 12th and October 12th. The Winged Throne. 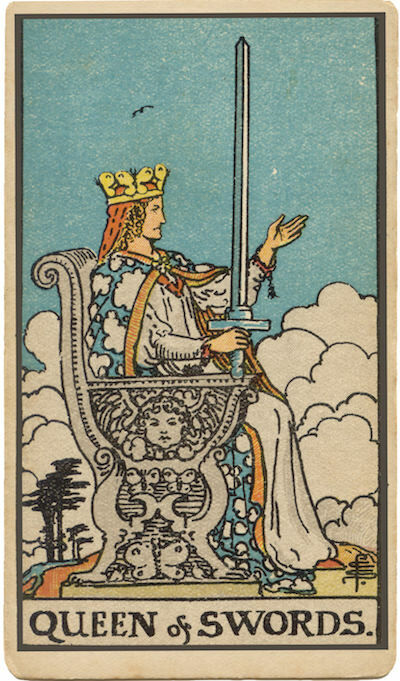 The Queen of Swords is frequently drawn ruling from a throne decorated with butterflies, birds, or other winged creatures, reinforcing the airiness of her suit. How does the element of air—matters of communication and intellect—play a role in your situation? The Posture of Pronouncement. The Queen of Swords often appears to be on the verge of making an important statement or rendering an important verdict. In your own situation, what needs to be said? Who needs to say it? What is the obstacle blocking this critical communication? From Discord to Harmony. What skill or aptitude, employed now, might transform the discord you’re experiencing today into pure harmony? The Marseilles Image. The Marseilles Queen is focused on the Sword in her right hand—the hand of linear logic. How might the advice of a cooler, more objective advisor help you now? Where might you find such an advisor? How might you elicit his or her assistance? What do I have a knack for? How might my special gift prove useful now? To what extent am I capable of saying what needs to be said? What is the best possible way to say what I want to say?